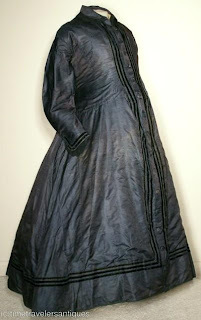 Today’s dressgasm is not exceptional in its beauty or design but it is extremely unique in that it’s both a maternity dress and it’s such a dark color. I don’t know a lot about the background of this dress since I think it was a picture lifted from an old eBay listing (I could be mistaken though). The dress is either black, faded and stained in some places, or it’s a charcoal or navy color. Sometimes it’s difficult to tell when the aging of the fabric can sometimes alter the color’s original depth and intensity. 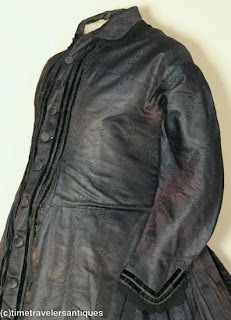 The sleeves appear to be modified coat sleeves with black trim and the same black trim can be found along the front of the dress and around the lower foot of the skirt. I can’t quite tell what type of fabric that makes this dress but my best estimate is it might be silk taffeta or a silk wool blend or a silk cotton blend. If it’s not some type of silk, I would be surprised, because heavier fabrics don’t typically wrinkle or crinkle like that from what I have seen in the past. It’s not so common to find in tact maternity dresses from the nineteenth century because most women didn’t have the money or the resources to have new dresses made for when they were pregnant. In most cases, women altered existing dresses for the pregnancy and then altered the dresses again when they lost the baby weight. Women spent a great deal of their married lives either pregnant or nursing so they also spent a lot of time in confinement. It was inappropriate for a woman to be out in public if she could possibly help it once the pregnancy was too far advanced to hide the baby bump. A lot of women just wore their house dresses, which were loose-fitting dresses usually in paisley or calico for most people and better material for the rich. For that reason, most house dresses can be advertised as possible maternity dresses as well but because they were so loose, it’s very difficult to tell if they were actually used during pregnancy or not. This particular maternity dress is odd to me because it’s so dark and it looks more like a DRESS than a house dress. I think this lady must have had some money or she never re-altered the dress after the pregnancy was over. The lace trim and stripe trim cost money for just a house dress or a temporary garment to be worn around the house in confinement. Was this lady vain? Was she rich? Or could she possibly have died before she had a chance to take the dress in after birth? Childbirth was the leading cause of fatality among women and the child mortality rate was sky high. One thing is clear: this maternity dress speaks of mystery to me and that’s why I chose it. You have a nice blog. A 40-week pregnancy is really just a blip in our whole life time, but the problem with maternity clothing during that time is very painful. Keeping this in mind, two best friends and mother of two children each started http://www.bellybundles.com. We have high quality maternity clothes there and we would like to hear your feedback on our products. >This is facinating to me as well. Thank you so much for blogging and sharing it.